Software programmer Patrick Millward and graphic designer Colin Pritchard were working on their own businesses when they met and realized how well their skills meshed, so they began to build apps together. Officials at Ottawa’s Queensway Carleton Hospital were impressed by a wayfinding prototype the pair developed and wanted to order touchscreen directory kiosks for all of the building’s entrances. Millward and Pritchard decided to create a health-care service company and bounced their plan off Tony Bailetti, a professor at Carleton’s Sprott School of Business and the founder of Lead To Win (LTW), an incubator for startups with high-growth potential. Bailetti encouraged Millward and Pritchard, the company’s COO, to apply for admission into Lead To Win. Ventures must satisfy a panel of external reviewers to gain entrance; if successful, they get access to an array of entrepreneurship support – from workshops and networking opportunities to professional office space and a sales desk inside the state-of-the-art Carleton Accelerator. Bailetti also suggested that Millward and Pritchard enroll in Carleton’s Technology Innovation Management (TIM) program, where they are both currently working toward Master of Engineering degrees. This ecosystem has helped companies started by young entrepreneurs over the last five years generate $19.3 million in sales in 2014. And it caught the attention of Stockholm-based UBI Global, which ranked Lead To Win as one of the top 10 university business incubators in North America. 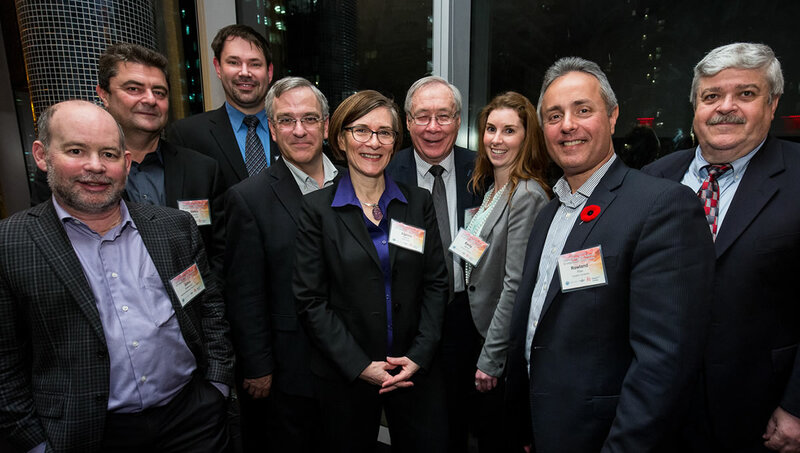 UBI Global honoured Bailetti and his team at an awards dinner hosted by the Ontario Centres of Excellence in Toronto on Nov. 3. Carleton’s LTW ecosystem can be conceptualized as a “big city” with various interconnected “neighbourhoods.” That’s a lot of moving parts – schools (the TIM program, Sprott’s Bachelor of Commerce and Minor in Entrepreneurship); gatekeepers (external reviewers of business and investment opportunities); a power plant (the Accelerator); food plants (the Nicol Entrepreneurial Institute, government grants); a business mall (lawyers, accountants, intellectual property experts, marketers and sales professionals who know how to help technology ventures grow); service desks (students who deliver services to venture teams); a financial sector (investors, business development banks); partner embassies (the University of Ottawa, Algonquin College); an R&D lab (TIM faculty and students working on research projects that advance the science and practice of technology entrepreneurship); and a municipal government (a council meeting weekly). When InteractiveStudios had a question about cybersecurity, for example, Lead To Win kicked into action and 10 people offered to help within a day. When InteractiveStudios was building its sales funnel, the Lead To Win sales desk developed a database of potential customers interesting in wayfinding that was worth more than $7 million. Sharing the Accelerator with other young entrepreneurs has also been a huge boost, says Pritchard, whose company meets with potential clients and demonstrates its products in the 4,000-square-foot space in Carleton’s St. Patrick’s Building. “We can learn from each other’s successes and mistakes,” says Pritchard. “It’s not a competition. We’re all growing together.” Moreover, the theories that he and Millward study as TIM students, such as online community design and open-source tools and processes, can be applied directly to their business. Ottawa tech entrepreneur Brian Hurley, a former Nortel Networks manager who graduated from Carleton’s Electrical Engineering program in the mid-1980s, launched a unified computing system business called Liquid Computing with the support of Lead To Win in 2003. He came back to the incubator in 2008 and started software solutions provider Purple Forge, which has partnered with IBM and TELUS, and lists the cities of Denver, Edmonton and Ottawa among its many clients. “With Purple Forge, as with Liquid Computing, Lead To Win provided me with a toolkit of knowledge, a network of expertise and access to resources which were key to my ability to launch and grow,” says Hurley. “I have continued to draw upon help from my network of Lead To Win peers, benefiting from their expertise as well as from having a friendly shoulder to cry on. Companies accepted by the Accelerator are expected to work toward annual revenue of $1 million within three years. They meet this goal by seeking sales around the globe and tapping into Lead To Win’s free services, such as the sales desk. Melissa Vong, who is working toward a Bachelor of Commerce in entrepreneurship at Sprott, was accepted into Lead To Win last year. Her company, Abyond Travel, offers customized group bus tours to places like New York City and Montreal. Carleton students who work for the Lead To Win sales, marketing and ICT desks showed Vong how to expand her client base beyond university and high school students to include corporate groups and retirees, and encouraged her to develop an app to enhance the travel experience. Lead To Win also helped her navigate (and pay for) registration with the Travel Industry Council of Ontario (TICO). Abyond organized eight trips and earned $90,000 in revenue in fiscal 2014 and, despite four months of downtime while awaiting TICO registration, Vong is aiming for 17 trips and $150,000 this year.